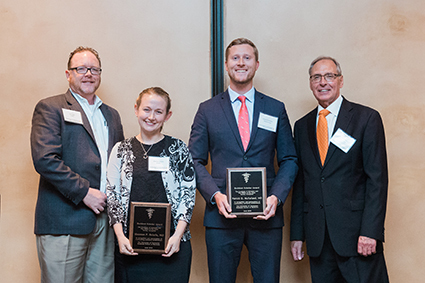 The UT Graduate School of Medicine recognized residents and fellows for their achievements as scholars and in scholarly activity at the 2018 New Resident and Fellow Reception and Awards Ceremony. The 2018 Outstanding Resident Scholar Award was presented to Shannon Beierle, MD, Surgery Resident, and Patrick McFarland, MD, Anesthesiology Resident. The Outstanding Resident Scholar Award was first presented in 2014. To determine awardees, AOS faculty members, chaired by James Lewis, MD, created a point system used to score research efforts including grants, publications, presentations, and IRB-approved ongoing projects; teaching achievements including teaching awards, presentations at educational conferences, invited lectures and teaching or administrative chief residents; patient care feedback including annual resident exams and The University of Tennessee Medical Center Guardian Angel program; and service through professionalism, service to charities and appointments on committees. The candidates nominated for the award well represent the UT Graduate School of Medicine mission for excellence. 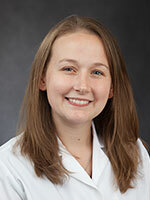 Dr. Beierle is the 2018-2019 Chief Resident. As a resident, she completed a research year and has presented at national conferences and published several research papers. In addition to research, Dr. Beierle has actively participated in curriculum development, helping to re-organize the national-based education program to fit the scheduling needs of the department. Dr. Beierle is also the Morbidity and Mortality Conference Resident Coordinator and worked to build no-table resident comradery. 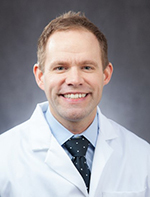 Dr. McFarland has been selected as a Perioperative Medicine fellow following graduation from the Anesthesiology Residency program. He has served in several leadership roles at a local, regional and national level which include serving as the Governing Council Chair and Resident Representative to Independent Medicine’s Political Action Committee of Tennessee, Resident Representative for the American Society of Anesthesiologists Political Action Committee, Resident Representative for the Dean’s Board of Visitors for the UT Graduate School of Medicine, and Resident Delegate for the state of Tennessee. He has also served as Chief Resident for two years and scored in the top 10th percentile on the Resident In-Training Exams and the top 10th percentile on the American Board of Anesthesiology Basic Science Examination and Anesthesia Knowledge Tests. In 2018, the Research Awards winners were selected through a new process. Department chairs and program directors were asked to identify their department's overall best original research and case presentation through the individual departmental research day programs. 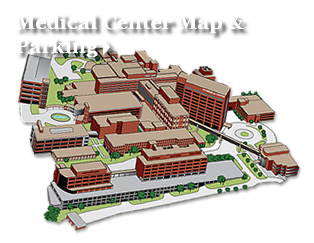 Departments then submitted abstracts and a team of reviewers identified a winner for Best Original Research and Best Case Presentation representing the residents and fellows at the UT Graduate School of Medicine. "A Correlation Between Emotional Intelligence and Burnout in Surgical Residents"
"The Use of Stereolithographic Models for Optimal Surgical Stent Fabrication in Complex Pre-prosthetic Vestibuloplasty and Dental Implant Placement: A Case Report"